Previous winners include Nelson Mandela and Malala Yousafzai. 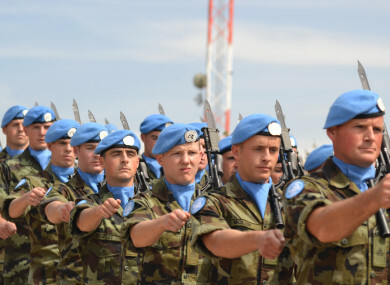 The Irish Defence Forces are shortlisted for their peacekeeping efforts. THE IRISH DEFENCE Forces Peacekeeping Mission and the president of Colombia are among those shortlisted for the prestigious Tipperary International Peace Award. 17-year-old Palestinian teenager Ahed Tamimi and renowned Kurdish humanitarian Dr Widad Akreyi are also shortlisted for the award, which has been awarded to major world figures since the 1980s and has brought figures like Nelson Mandela, Malala Yousafzai and UN Secretary-General Ban Ki-Moon to the town to accept the award. The winner will be decided later this month by the Tipperary Peace Convention Committee, with the date of the ceremony yet to be announced. The Defence Forces have been shortlisted for their involvement in peacekeeping missions around the world. Ireland is the only nation to have a continuous presence on UN peace support operations since 1958, with Defence Forces troops currently deployed in Lebanon, Syria, Israel and the Democratic Republic of Congo. 17-year-old Palestinian teenager Ahed Tamimi became a symbol of resistance after her altercation with an Israeli soldier outside her West Bank home. She was recently sentenced in a military court to eight months in prison. Tamimi has lost an uncle and a cousin in the violence, and other members of her family are frequently arrested. Colombian President Juan Manuel Santos received a Nobel Peace Prize for his efforts to end decades of conflict Colombia. He announced a landmark peace deal with the FARC militia, which had been at war with the Colombian Government since the 1960s, in 2016. The agreement was rejected by the nation in a referendum, but a new deal was later ratified by the Colombian congress. Dr Widad Akreyi is a renowned Kurdish humanitarian and human rights activist, known for lobbying for three UN agreements and her outspoken arguments for the rights of women and girls in the Middle East. She helped establish a secret working group against torture in Iraq and is the first woman born in the Middle East region to engage in advocacy and lobbying activities related to the illicit trade of small arms and light weapons. The winner is decided by Tipperary locals, where the award was created as a peace initiative that would promote the town. The award is given to individuals or organisations who have “made a particularly noteworthy contribution to the peacemaking process”, and the first award was given in 1984. Well-known Irish figures like Adi Roche, Bob Geldof and former President Mary McAleese have all received the honour. Last year, the award was given to the Syria Civil Defence, also known as the White Helmets. Email “Irish Defence Forces and Colombia's president among shortlisted for Tipperary Peace Award”. Feedback on “Irish Defence Forces and Colombia's president among shortlisted for Tipperary Peace Award”.